What’s so important about the Overwatch World Cup? “There are some really great players at this World Cup that aren’t signed to Overwatch League teams,” Elliot Hayes tells me. We’re in Paris, at the final Group Stage of the Overwatch World Cup, where France and the United Kingdom are dominating the competition. France won all their matches, and team UK won four of theirs, with their only loss coming at the hands of their French hosts. 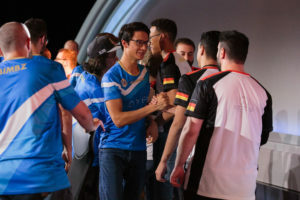 The Netherlands and Germany gave it a good go at times, but for the teams at the bottom like Italy and Poland, who won just nine maps between them across a total of 10 matches, was it even worth them turning up? To an outsider, calling this competition a “World Cup” looks like something of a misnomer. The team that eventually wins the World Cup, which will most likely be Korea for the third time in a row, will be filled with top tier, Overwatch League talent. So will the second and third place teams. For the OWL players at the World Cup, the prize money is a pittance compared to what they’re usually competing for. It’s the OWL that’s the pinnacle of Overwatch competition. However, there is a certain sense of national pride on the line, and it’s bringing together a global community that is front and centre of Blizzard’s ambitions with Overwatch esports. Plus, for some of these players, the World Cup represents a golden opportunity. It’s easy to dismiss the lower ranked teams as simply making up the numbers, but, just because they had next to zero chance of qualifying for Blizzcon, it doesn’t mean there aren’t good players on the team. Hayes is one of the coaches of the Philadelphia Fusion, the second placed team from the inaugural season of the Overwatch League. He’s also the head coach of the UK Overwatch League team at the World Cup, but that doesn’t mean his day job duties are on hold. He sees the World Cup as a potential scouting ground for new talent. Team UK has just one Overwatch League player, Isaac “Boombox” Charles. However, the rest of the team are on various Contenders teams, and so have a better chance than most to become full-time pros one day. It’s not guaranteed though. The Overwatch World Cup might not be the top tier of competition, it might not even be the second tier, but for a lot of the people at the event, this could be their best shot at getting into the Overwatch League, and that’s worth a lot.